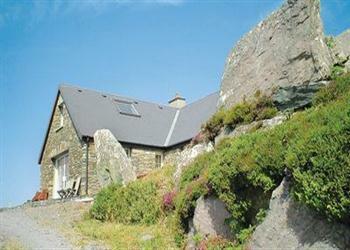 Aotearoa in Caherdaniel, Co Kerry sleeps 8 people. This spacious, stone built house with its own south-facing patio and terrace, Jacuzzi room and games room is set in an elevated position with superb views over the Atlantic Ocean. This Area of Outstanding Natural Beauty offers a wealth of sandy beaches, and all kinds of water sports. There are diving schools, fishing, riding, climbing and golf locally, as well as good pubs and restaurants in Caherdaniel (1 mile). Nearby is Derrynane National Historic Park, containing the former home of Daniel O’Connell, the famous campaigner for Catholic rights. Derrynane also boasts a Blue Flag beach, historic houses and gardens with a nature trail. The area is ideal for scenic walks, and there are two golf courses in Waterville, 8 miles. Ideally situated above the Ring of Kerry, making this a perfect location for exploring, further afield, you will be delighted with a day trip to Killarney, 40 miles, passing through the Lakes of Killarney. Kenmare is just 1 hours drive, and is the gateway to the Beara Peninsula and the scenic west Cork region. A mile away, you will find a beach bar serving food, and there is a local shop 200 yards (May/Sept). Shop 1 mile. Ground floor: Living/dining room with wooden floor. Kitchen with wooden floor. Utility room. 3 bedrooms: 2 double, 1 twin. Shower room with toilet. Separate toilet. First floor: Galleried double bedroom overlooking living room. Bathroom with shower attachment, bidet and toilet. Open fire in living room. Oil central heating and electric by meter reading. Bed linen and towels included. Travel cot. High-chair. Video. DVD. CD. Microwave. Washing machine. Tumble dryer. Dish washer. Fridge/Freezer. Patio with furniture. Barbeque. Jacuzzi room. Games room with darts and table tennis. Ample parking. Holidays at Aotearoa run from Saturday to Saturday. For a better idea of where Aotearoa is, you can see Aotearoa on the map below. Do you want to holiday near Aotearoa (ZP4), you can see other cottages within 25 miles of Aotearoa; have a look to find your perfect holiday location.